1. 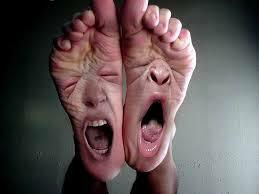 It’s actually more tiring to stand for one hour on your feet rather than walk for one hour! Why? Because with walking, the muscles are acting dynamically (constantly using several different muscles working together). Standing in place for one hour causes a muscle group to fire for an extended period of time, eventually causing fatigue. No wonder patients complain more about their feet hurting while working rather than during exercise! If you have “tired feet” from standing for long periods of time for work, call Advanced Podiatry at 813-875-0555 for an appointment today! Let the doctors at Advanced Podiatry help reduce pain in your feet associated with working or standing for long periods of time! What Insect Uses Its Feet To Taste??? ?